One of the largest of the DEC's wildlife management areas in Oswego County is the 8,898 acre Happy Valley WMA. This beautiful Wildlife Management Area is located east of I-81 at exit 34. Happy Valley is bounded on the north by NY 104 and on the south by Oswego County Route 26. The acreage is a combination of upland, wetland, and a few very nice ponds including St. Mary's and Whitney Pond. Both of these offer ideal canoeing and kayaking plus some excellent fishing. 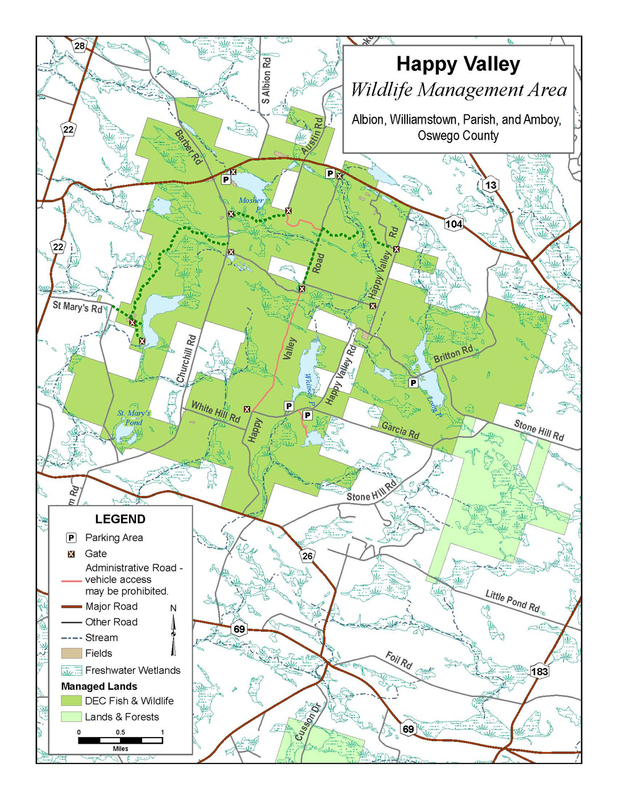 There are multiple hiking trails in the WMA. This WMA offers a multitude of activities for outdoor adventurers including hiking, bird watching, snowshoeing, fishing, hunting, cross country skiing and trapping. You can find numerous gated dirt roads to park and explore in the WMA. This is a great place to bring your backpack and practice with your gps device. There is a picture, a video and a map of the area below.